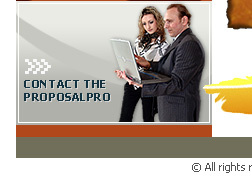 ..::Welcome to the Proposal Pro::..
Let the ProposalPro be your first stop for proposal surge support! Whenever your company needs additional help in proposal management, proposal writing, proposal editing, or layout support – contact the ProposalPro. 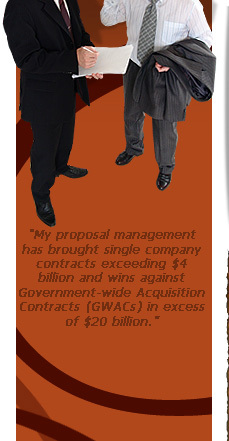 The quality of proposals plays a major role in any company's success. The ProposalPro works with you to create compelling, customer-focused proposals that win business. With expertise in developing and improving complex proposals, the ProposalPro delivers exactly what you need, whether it is proposal management, writing, editing, layout and design, or a combination of these skills. Working as part of your team, I will help you create a response that gives clear and compelling reasons why your client should choose you. The result - Your proposal will contain truly customer-focused text that is well-structured and attractively presented.